Second edition of Nardi’s chief work, an account of the previous century of Florentine history from the standpoint of the defeated Savonarolian republicans. 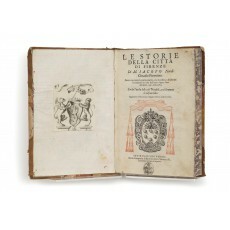 The first edition had been published in Lyon, in 1582, and this reprint is testimony to the new freedom of speech then prevailing in Florence, and extended by Ferdinando I. Our copy has on its title-page the black ink ownership stamp of an unidentified member of the Martelli family of Florence; the family’s exlibris is pasted to an endpaper. The copy presumably was supplied directly by the printer, Bartolomeo de’ Libri (Bartolomeo Sermartelli), who for commercial reasons had adopted the name of his patrons, the Martelli family. Le storie della citta di Firenze… Doue con tutte particolarità̀, che si possono disiderare si contiene cio che dall’anno 1494. fino all’anno 1531. è successo. Con la Tauola della cose Notabili, e co’ Sommari à ciascun libro[.] Aggiuntoui vn’ istruzione per leggere le storie ordinatamente. quarto (210 mm), (212) ff., signed a8 A-Z8 Aa-Bb8 Cc4 and paginated (16) 1-390 (18), woodcut of Medici insignia on title-page (printed in black), beneath Cardinal’s hat (printed in red); woodcut initials. Margins of the title-page reinforced at an early date, occasional spotting, but overall in good state of preservation. In an Italian 18th century half-calf binding, patterned endpapers, painted pages edges. Second edition of Nardi’s chief work, an account of the previous century of Florentine history from the standpoint of the defeated Savonarolian republicans. The author was descended from an old patrician family, traditionally anti-Medicean. He had been active in both political and literary life in Florence, serving on the Signoria (1509) and on the Sedici Gonfalonieri (in 1512, 1519, 1522, 1527), writing plays and poetry, and the programmes for festive triumphs.2 After sentenced to exile, in 1533, he settled in Venice, where he became a free-lance writer of political and historical works in favour of the re-establishment of a republican constitution. Our copy of the second edition bears on its title-page the black ink ownership stamp of an unidentified member of the Martelli family; the family exlibris is pasted to an endpaper. The copy presumably was supplied directly by the printer, Bartolomeo de’ Libri, son of the printer Michelagnolo de’ Libri, who for commercial reasons had adopted the name of his patrons, the Martelli family.6 ‘Bartolomeo Sermartelli’ dedicates the book (4 April 1584) to Alessandro Ottaviano de’ Medici, Archbishop of Florence, drawing attention to his recent elevation into the cardinalate (12 December 1583) on the title-page. 1. Achille Bertarelli and David Henry Prior, Gli ex libris italiani (Milan 1902), p.247; Jacopo Gelli, 3500 ex libris italiani (Milan 1908), pp.245–246 and fig. 462; Egisto Bragaglia, Gli ex libris italiani dalle origini alla fine dell’Ottocento (Milan 1993), ii, no.1541 (as circa 1730). Cf. Alessandra Civai, Dipinti e sculture in casa Martelli: storia di una collezione patrizia fiorentina dal Quattrocento all’Ottocento (Florence 1990), p.94: ‘nel corso dell’Ottocento la biblioteca Martelli… era considerata una delle più cospicue della città’. 2. Nardi was the principal planner of the celebrations held in Florence for the entry of Pope Leo x in 1515 and gives an account here of the Pope’s entry and sojourn, as well as an account of the elaborate carnival parades which he planned in February 1513; see Bonner Mitchell, Italian civic pageantry in the High Renaissance: a descriptive bibliography of triumphal entries and selected other festivals for state occasions (Florence 1979), pp.38–39. 3. 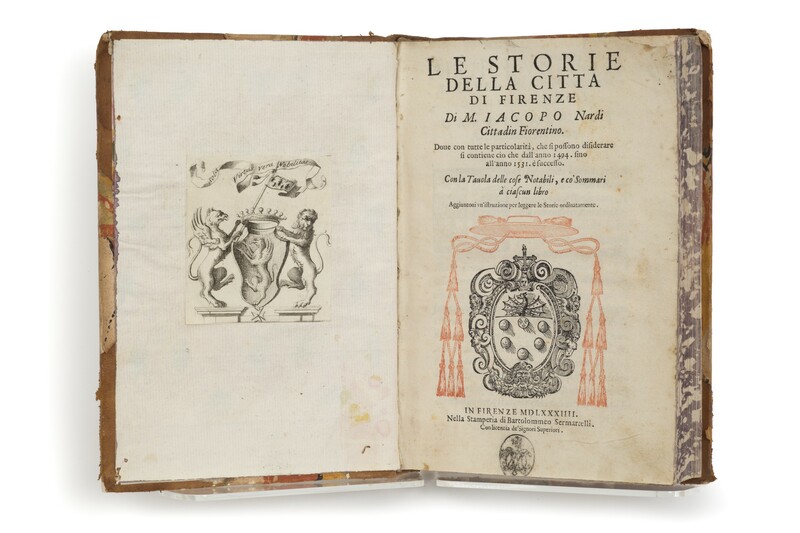 Lucie De Los Santos, ‘La Vita di Giacomini et les Istorie de Iacopo Nardi: genèse de deux projets historiographiques post res perditas’ in Storiografia repubblicana fiorentina (1494–1570), edited by Jean-Jacques Marchand and Jean-Claude Zancarini (Florence 2003), pp.311–323, argues for an earlier date (1548). 4. Vanni Bramanti, ‘Sulle Istorie della città di Fiorenza di Jacopo Nardi: Tra autore e copista (Francesco Giuntini)’ in Rinascimento 37 (1997), pp.321–340 (pp.321, 325–326). Nicholas Scott Baker, ‘The Remembrance of Politics Past: Memory and Melancholia in Jacopo Nardi’s Istorie della città di Firenze’ in After Civic Humanism: Learning and Politics in Renaissance Italy, edited by Nicholas Scott Baker and Brian Maxson (Toronto 2015), pp.261–274. 5. Théa Picquet, ‘Jacopo Nardi. Regards sur un passé perdu: le livre x des “Istorie della città di Firenze”’ in Rinascimento 36 (1996), pp.407–430. 6. D.E. Rhodes, ‘Postille alla carriera di Bartolomeo Sermartelli’ in La Bibliofilia 85 (1983), pp.41–48.